Ross, it’s your big birthday coming up! What do you have planned? My best friend booked me a trip to Amsterdam for my birthday so we will be cycling around the canal ways, soaking up the culture and visiting as many coffee shops as possible. There will also be nightlife involved and at least one decent hangover. I’ve heard that 40’s are easier than your 30’s – you don’t sweat the small stuff so much. I’m counting on this to be true. I also enjoy it when people guess my age and get it amusingly wrong. I’m looking forward to surprising them even more now. Remodel the upstairs of my listed cottage and fall out with the conservation planners. Visit India or Morocco – I’ve always considered them mature destinations. I now consider myself mature. Fly in a hot air balloon over the Cotswolds. I’d love to see my doll house whilst flailing around in a wicker basket 2000 feet above. Work on getting a 6-pack. I’ve currently got 2 cans in the fridge. Go back to San Francisco. I left my heart there in the 90’s and I need to go and get it back. Ross you have now worked at First Choice Conference & Events for nearly a quarter of your life, I know your colleagues are fabulous but what makes your job great? Wow, that’s gone quick! Where are these fabulous colleges? (joke). I love the diversity of the job – it keeps me from falling asleep like other jobs have done. Also it’s great to sample an amazing venue and then gush about it to our clients! Plus it allows me to do what I do best – talk a lot. You’re about to say goodbye to your 30’s, if you had one piece of advice for someone entering theirs what would it be? Embrace it. You’re leaving those days of delinquent behaviour in your rear view mirror. Lastly, if you could have a special birthday dinner with any 3 people in the world who would you invite and why? Tori Amos. Massive fan…huge. I’d probably burst into tears and she’d leave. Stephen King. The conversations would get dark. Stephen Spielberg. I’d scold him for traumatising me with the T-Rex attack in 1993. 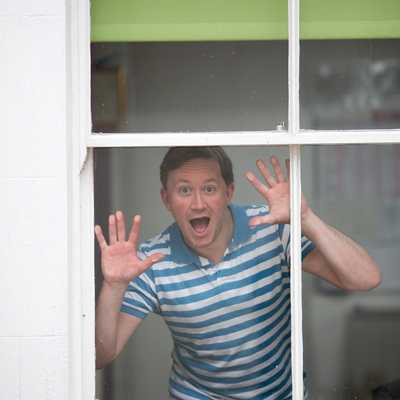 Not just your colleagues who you have to put up with, but also some mad clients…………. Have a fab fab time, enjoy hitting the forties with style. Awww, thanks Bev I had an amazing time in Amsterdam. Looking forward to seeing you again soon!